Back in 1864, the townspeople of Sandwich had high hopes that salt and oil deposits seen on the surface of the ground near the far south side of town meant they were about to strike it rich. The most enthusiastic of Sandwich's citizens was John B. Gauthier who operated a general store, brickyard and potash operation and just happened to own the property in question in the Brighton Beach area. For years, he had urged the town to sink an oil well. Finally, in 1866, he rallied enough support; the mayor, Charles Baby, believed that if oil were struck it would benefit the community immensely. A meeting was held at the Western Hotel, next to the courthouse (now MacKenzie Hall). After much discussion and speechifying it was decided to form an oil company called "The Sandwich Petroleum Oil Company". Selling shares for $100 each netted $10,000; $4,000 was gathered that night! Gauthier made arrangements for the new company to buy an engine and well boring machinery. Peter Sleeman was put in charge of the operation, and the well was sunk on Gauthier's property. Day after day, locals were on pins and needles anticipating the oil strike. Finally, at 900 feet, a giant plume shot 30 feet into the air. They had struck something all right! It wasn't oil, but would prove to be almost as valuable. News of the strike spread like wildfire through town. Within a few days, thousands of people from all over Canada and the United States arrived to see what had proven to be a magnificent mineral spring. The Sandwich Petroleum Oil Company had the water tested with astonishing results. The water was pronounced the most valuable and best in the world! Soon after the discovery, the town experienced a tourist boom. Gauthier built a giant hotel on the site and the Oil Company erected a bathhouse. People from all over North America flocked into town to see the Sandwich Mineral Spring. 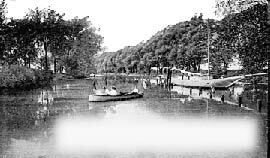 To encourage more visitors a large canal wide enough to accommodate a ferry was dug from the Detroit River to within a few yards of the spring. The ferry ran from the foot of Woodward Avenue in Detroit to the Sandwich Mineral Spring- 25 cents round trip. It became a common site to see as many as 10,000 to 25,000 people in Sandwich on a Sunday or holiday. Many were afflicted with diseases and believed the mineral water would cure them. They bathed in it several times; some found their ailments, ranging from asthma, rheumatism, neuralgia, scrofula and liver problems, disappeared. Many left their crutches and canes behind. Could the mineral water have actually cured these people? After a few years of unrivalled business problems arose between owners of the mineral spring. Gauthier and a Mr. Clark, who had become his business partner, were at odds as to how the business should be run. Clark wanted to open a giant resort on the property and purchased stock in an attempt to gain majority ownership. Matters became most unsettled one night. Eight large boulders were placed at the mouth of the canal leading to the spring. When the ferry came across the next day, it became trapped on the boulders for some time. Shortly thereafter, Gauthier brought a lawsuit against Clark, deemed the culprit in the boulder affair. In court it was determined that eight boulders were placed in Detroit on two ships owned by Clark, known as the Twin Scows, and sent to the canal, under Clark's authority. Clark was fined just one York Shilling and notified he had to remove the boulders to Gauthier's satisfaction. Until the late 1880's, the Sandwich Mineral Spring, which underwent several name changes, including Manhattan Park, attracted large crowds but ferry service ended during this time so fewer people attended the spring. It is believed that the spring dried up at the end of the 1880's. In 1891, after several ownerships, the original company wound up its affairs and closed. The property was sold back to Gauthier. The original Sandwich Petroleum Oil Company never did strike oil. However, their discovery of a natural mineral spring brought more pleasure to the town in general than oil could have to a few. Resources for this story included the "Township of Sandwich, Past & Present" by Fredrick Neal, of Sandwich, 1909.